IBASSIN: 2018 FLW Tour Harris Chain Day 1: Jamie Horton Leads with 24-13lbs! 2018 FLW Tour Harris Chain Day 1: Jamie Horton Leads with 24-13lbs! Horton's 2 big bass pave way to lead. They say you should make hay while the sun shines, and apparently the FLW Tour’s best pros already knew that. They steamed back to Florida’s Harris Chain for the second event of the season, which is presented by Lowrance, and enjoyed a sunny, breezy, all-around beautiful first day that resulted in 11 limits of more than 20 pounds. Their co-angler partners added four more 20-plus bags. At the top of the heap is Alabama pro Jamie Horton, who weighed 24-13 to take the early lead over Florida’s Koby Kreiger. Kreiger, who was assessed a 2-pound penalty after he violated rule No. 9 by running the main motor while he was on the front deck, trails Horton by just 1 ounce. 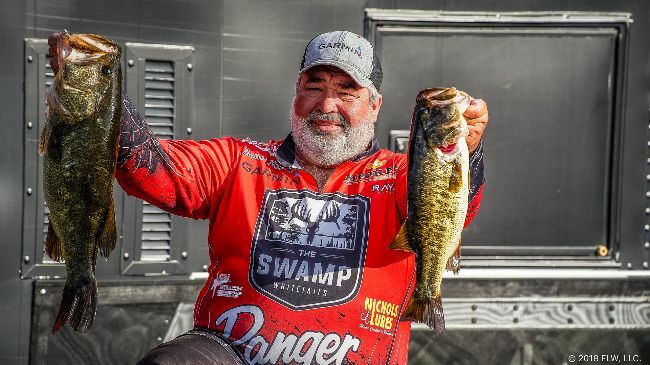 Horton admits he didn’t really have a sound game plan coming into the day, but he had two patterns that he knew had the potential to produce limits of fish. Thankfully for Horton, he was able to put a few in the boat early to relieve some of the pressure caused by his uncertainty. With what would eventually be his second-best kicker in the boat early, Horton switched his attention from shad eaters to spawners in an area where he’d found bedding fish in practice, but where he didn’t expect to see the quality he found during day one. Thankfully, the water had cleared a tad, allowing him a better visual approach, and he was able to slowly decipher what they were “sitting on.” From there he just chipped away at 24 pounds. Horton wound up weighing in two keepers from the shad spawn pattern and three keepers caught while bed-fishing. Two of those were caught sight-fishing, while the other he caught blind-casting in the area. He knows his lead is thin and the potential for monster stringers is high tomorrow, so Horton says he’s skipping the shad spawn program in the morning and racing straight to the remaining beds he located today. The biggest hurdle is company. Several other pros were in his best area today, so he’ll have to share and make the best of what’s left if he wants to hang around the top of the standings after Friday’s weigh-in.